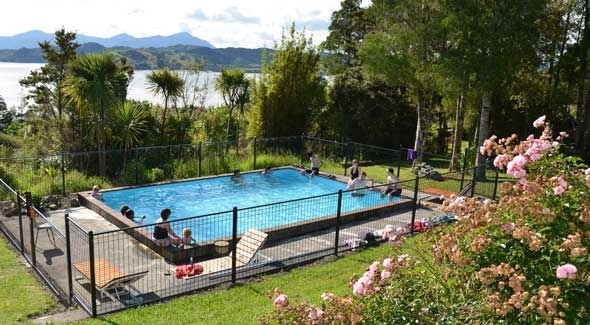 Rawene Holiday Park is located in the picturesque township of Rawene, Northland. Situated on a hilltop, sheltered by native bush with stunning views over the Hokianga Harbour. Just relax in this peaceful retreat, take a stroll to Rawene with its historic buildings, arts and crafts, café, restaurant and mangrove walkway, or explore one of the many wonderful spots that the region provides. Take a walk on the beach at Koutu where you will find the Koutu Boulders, one of Hokianga's best-kept secrets. The largest boulders are up to 3 metres in diameter, absolutely amazing! The walk is best done within the two hours either side of low tide. 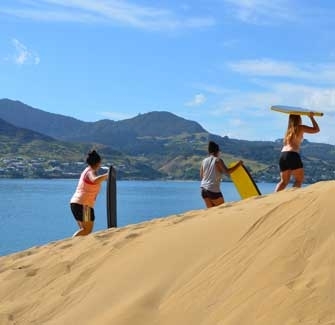 Get a boat trip to the base, a boogie board and one hour of fun while dunesurfing. Or climb up the dunes to visit the spectacular sandstone formations. Amazing rock pools, accessible at low tide. A hidden treasure off the beaten track! The stunning encounter with boulders and an awesome stroll through the world's unique Basalt Boulder Valley. Walk over many bridges through native forest till you reach the platform, and enjoy the wonderful view. Small West Coast settlement, a place of immense natural beauty, with dramatic landscape. A region few tourists have ventured. A very exciting way to experience the beauty of the Region. 1 to 6 hour treks, hill country or beaches. Bookings essential. Nice, sandy swimming beach in the sheltered Hokianga Harbour. Visit this superb forest sanctuary abounding with rare New Zealand flora and fauna, among a subtropical rainforest. One of the highlights is Tane Mahuta, the largest kauri tree in New Zealand, with an estimated age of 1200 years. Hot springs with many different pools to choose from. 5 mins East of Kaikohe. Very relaxing experience! Indulge yourself and have a relaxing Swedish or other therapeutic massage performed by a trained therapist. Bookings essential. Explore the charming, historic seaside town of Rawene. Hokianga Harbour Ferry, Mangrove boardwalk, historic Clendon House, famous Boatshed café, shops, arts and crafts, petrol station.